Is there enough thrust generated by out gassing to change rotational characteristics appreciably? The comet’s axis of rotation and center of rotation are probably sensitive over longer time scales to small changes in center of mass from out gassing. Expect precession wobble and tumble to be amplified with uneven mass loss. The change in orbital characteristics around the sun can be characterized as this mission progresses. The bi lobe apple-core look might well be a result of a few previous trips near the sun – Equatorial incident radiation (hot spin equator) heating over many trips would be a way to make bilobed comets common provided each lobe isn’t compositionally distinct. Gentle collisions between similar sized and composition objects that have been falling toward each other for years in space can happen of course, but that asks for a large amount of rare luck when extended to to explain this common shape group as a whole. Ken’s ‘weekend treat’ is WAY beyond phenomenal this time! 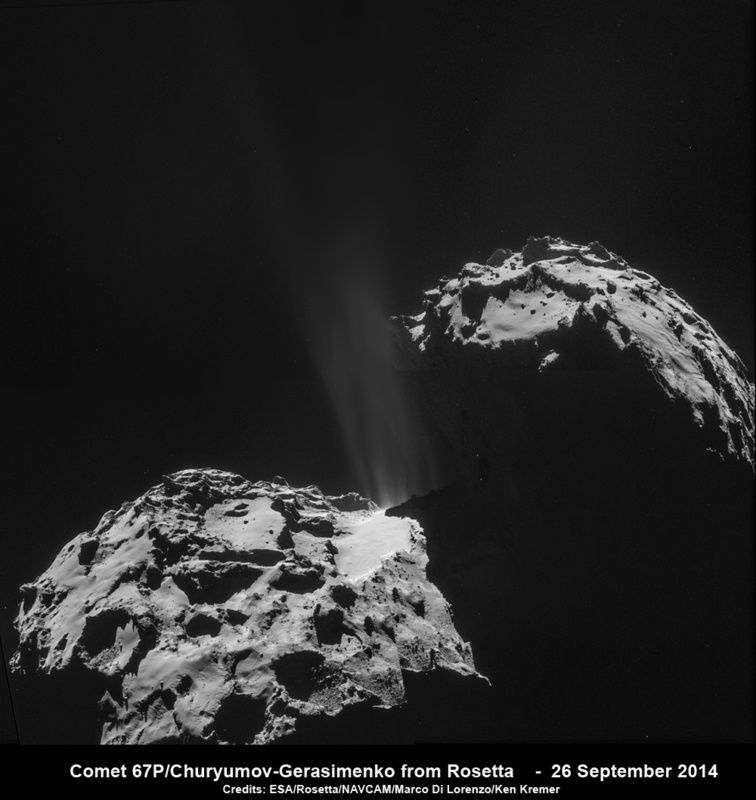 Chury-Gury may not be a Halley’s or a Hale-Bopp, but it sure is impressive… Go Rosetta! Wow! this Comet looks Almost Alive isn’t Nature Fantastic? Really? I think it looks more like death than anything I could have imagined. Like an alien deadhead pirate flag sailing the seas like a stinking boiling torpedo. Here’s hoping ‘Chury-Gury’ gets even more lively as time goes by! I went to the Rosetta site where they say C-G has months of possibly increasing activity ahead. Isn’t it awesome how Mr. Sol ‘brings to life’ all that comes close? Tell you what.. as a ‘pantheist’, I (We) believe the whole universe is alive… even FALA! Next PostNext What Is A Dwarf Planet?